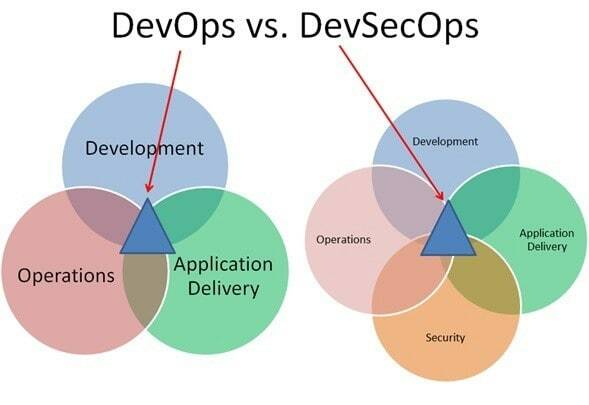 DevOps has evolved big time since many of us thought it was just a buzzword. Now we know that is a myth. DevOps has become a main focus and has been shaping the world of software for the last few years. Experts say that DevOps is going to be the mainstream and its popularity is going to reach its peak in 2019. Below is the Google trend shown for the term "DevOps" and a hypothesis of its projected growth in 2019. 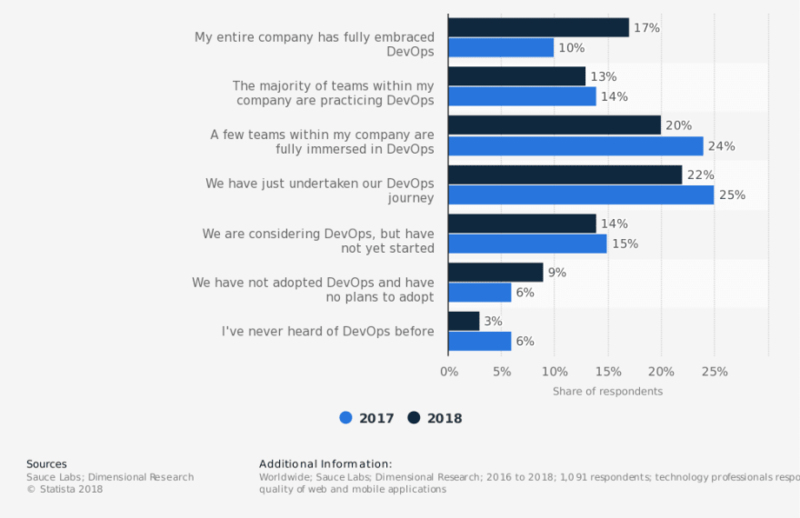 To talk about the stats, DevOps adoption has increased approximately 8% from 2015 to 2016, and this number is expected to grow significantly in 2019, as shown above. According to Statista, many business organizations are adopting DevOps and there is an increase up to 17% in 2018 than what was about 10% in the year 2017. You can read the whole report by RightScale. Even the Forrester report clearly mentions that 2018 is going to be the year of DevOps. My recent article on the facts and stats about DevOps received a great response among DevOps enthusiasts, and it just shows many technology evangelists are interested in knowing more and implementing DevOps in their organizations. Today, we will see the five facts that will shape the future of DevOps. Pipelines show you a complete visualization of your app from source control to production. You can see everything in a single pane of glass. It not just about doing CI now, it is about CD (continuous delivery); organizations are investing their time and effort into understanding more about automating their complete software development process. In 2019, the shift is going to happen from just a CI pipelines to DevOps assembly lines. In DevOps, we talk a lot about automation. If possible, zero-touch automation is what the future is going to be. It doesn't mean you have to automate everything, but if you have to, then you should be able to do it. 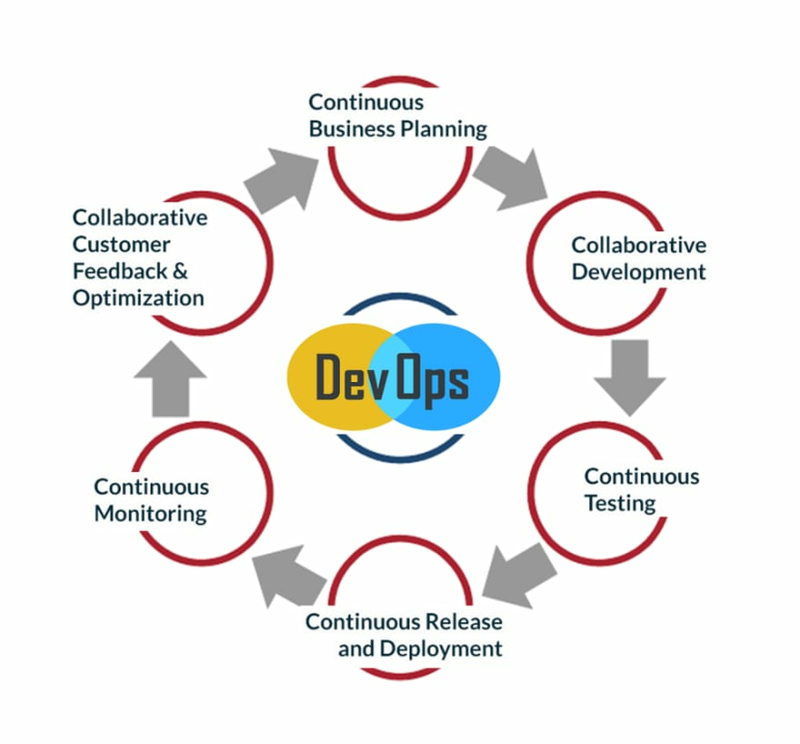 Understanding the 6 C’s of the DevOps cycle and making sure to apply automation between these stages is the key, and this is going to be the main goal in 2019. Testers who know how to code and automate scripts to test various cases are in huge demand in DevOps. If you are a tester and in a dilemma over whether to learn coding or not, we recommend learning to code. 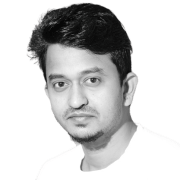 Understanding different DevOps tools and automating scripts plays a vital role in the software development today and this is going to dominate in 2019. 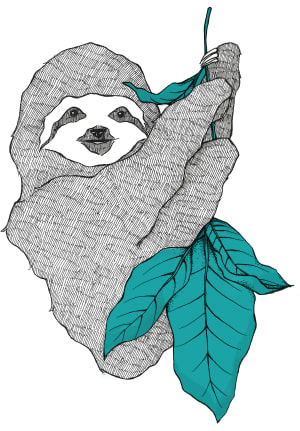 Testers are expected to perish if they don't learn to code and write their own automated test scripts. Manual testing will become obsolete in 2019 and it consumes a lot of time. Automation in testing not only increases the efficiency but also ensures the features are delivered faster to the market. DevOps and microservices lately are going hand in hand. Microservices are independent entities and hence doesn't create any dependencies and break other systems when something goes wrong. Microservices architecture helps companies make deployments and add new features easily. Companies are expected to move to microservices architecture to increase their runtime and efficient delivery. Don’t just follow others because they adopted it, know yourself and understand why you should adopt a microservices architecture. There are many companies that are still in a dilemma of whether to build or buy. But, we recommend you to do what you are best at and buy the tools as per your requirements. This not only helps you focus on your goals but also increases the productivity by entirely depending on the 3rd party platform. Many companies are now going for enterprise versions to get their own infrastructure and make sure security is in the best hands possible. Kubernetes has become the fastest growing container technology because of its offerings and ease to use. Kubernetes has built a great open source community around it. Around the world, many CIO’s and technologists have adopted to use Kubernetes and it is expected to evolve in 2019. 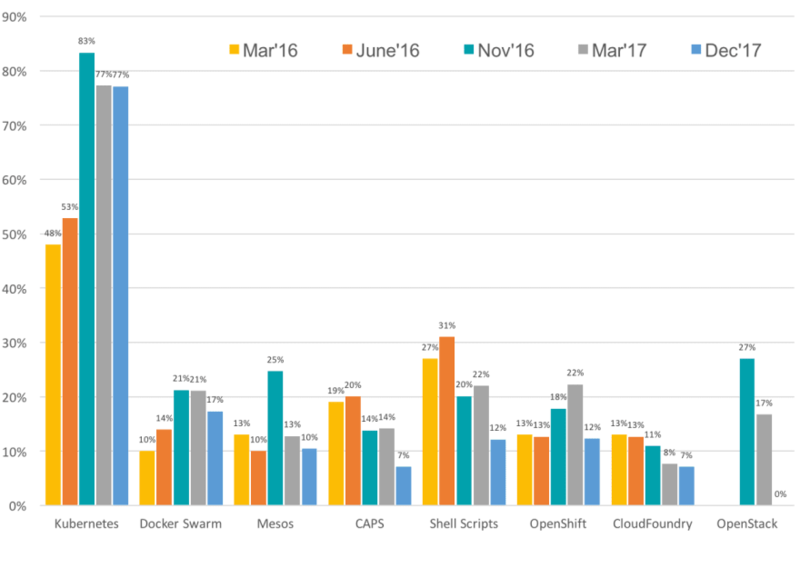 Recently, leading up to KubeCon + CloudNativeCon North America (December 6-8, 2017), the Cloud Native Computing Foundation conducted a survey and shared how the Container Orchestration Landscape is changing and moving towards Kubernetes. Source: The Container Orchestration Landscape is Changing. The CICD pipeline makes it possible to employ rapid changes daily to address customer needs and demands. The CI/CD pipeline can be automated as well, and hence Security has to be a design constraint these days. Thinking security right from the beginning requires security to be built into software instead of being bolted on, Security is no more an add-on. Recently we have seen a rising trend of DevSecOps, DevSecOps is about injecting security first in the life cycle of application development, thus lessening vulnerabilities and bringing security closer to IT and business objectives. This model assumes everyone is responsible for security and hence less noise and dilemma on who did what and what went wrong. BTW, Assembly Lines are the next wave of DevOps. Let us know if you have any other suggestions and observations that you think will shape DevOps in 2019. Sorry. 2 and 3 are wrong. I suggest you research the topic of exploratory testing as it sounds like your current thinking about testing is based on a misconception about the craft. Thanks for your views Dan. I'll definitely take a look at what you are suggesting. One suggestion in step 2 is to draw a big circle around all and call it Continuous Quality Assuarance (CQA) because that is what it is. Dan I think we need to look at the craftsmanship of testing in another way in this context. 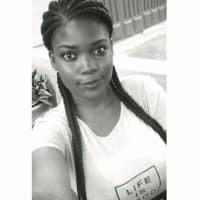 Of course we need to have exploratory testing but as you mentioned test or as I say Quality Assurance is everywhere in the process and is everybody responsibility. In my view you need to understand code in some way. To say manual testing would be obsolete is as stupid as saying manual development would be obsolete. I guess you mean that manual checking would be obsolete. Microservices are independent entities and hence doesn't create any dependencies and break other systems when something goes wrong. This is deeply wrong and miss the whole definition of what a system is. The only way to have no dependency and not break any other system when something goes wrong is to use no external system and to have no consumer of your own system. Microservices do the contrary by multiplying the number of services linked to each other. All microservices does is make the boundaries between systems obvious to generate friction point when they change. Perfect agree with Dan Ashby.Pavan, Manual or exploratory testing are key to understanding the application and creating great automation. I'd also would like to point out that user experience is as "manual" as the interaction with the software intended for humans could be. It does sadden me when I join the team which claim that devs do all the testing yet devs themselves have very minimal or none existing interaction with the app on the layer where it will be used the most by the client. Read: Coders are expected to do (more) testing. Am I the only one who thinks that "projection" for the future is completely at odds with the rest of the graph from a statistical perspective? “DevOps engineer” is really just a title used to hire sysadmins?